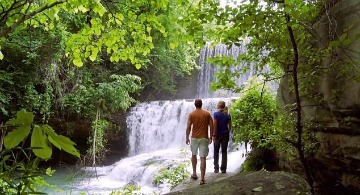 Here’s some fun and affordable Arkansas romantic getaway ideas. It’s called the Natural State, and you'll discover some of the most beautiful mountains and valleys in the South. Romantic things to do in Arkansas? There’s State Parks with peacefully beautiful forests and rivers. Fun activities on over 600,000 acres of lakes. Or a romantic dinner while watching the moon rise above the Ozarks from the porch of a romantic B&B or secluded lakefront cabin. Best Time to Visit Arkansas: spring and autumn seasons are great times to be here, with comfortable temperatures and great colors. You might find summer in Arkansas a bit too warm and humid if you're not from the South. Hot Springs, AR – welcome to Spa City! The 140+ degree natural hot springs are a big attraction here, and you can sample the soothing water at various spa & mineral baths, including Buckstaff Bathhouse Co. on Bathhouse Row. Have fun like kids at Magic Springs & Crystal Falls Theme Park. Ride a horse-drawn carriage through the historic downtown. Enjoy a romantic sunset dinner cruise on the Belle of Hot Springs Riverboat. Lookout Point Lakeside Inn Romantic B&B Getaway - a wonderful spot for a Hot Springs, AR romantic vacation. Explore beautiful and serene Lake Hamilton, laze away the afternoon on a hammock, or rediscover your romance with one of their couples packages. 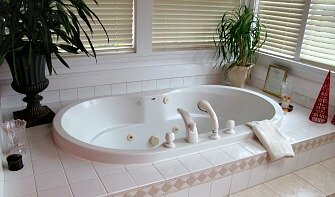 Nestled in the Ouachita Mountains overlooking the lake, this luxury bed and breakfast is perfect for your romantic getaway.There's captivating views from the spacious whirlpool tub guest rooms, and each morning a gourmet breakfast is served at your private table or outdoors by the waterfalls. You and partner will experience will experience the ultimate in luxury, R&R and Southern hospitality during your stay here. Romantic Cabin Getaways in Hot Springs, AR from $55/Night - enjoy a lakefront secluded spot in the wilderness beauty of Lake Hamilton. This romantic one-bedroom couple’s cottage is perfect for a inexpensive and relaxing honeymoon or getaway, and gets top marks for cleanliness, location and friendly owners. Crater of Diamonds - if diamonds are a girl’s best friend, she just might love this State Park, the only public diamond mine in the world. You can spend an afternoon digging for treasure here, and keep whatever you find! Located just over 2 miles southwest of Murfreesboro in Western Arkansas. 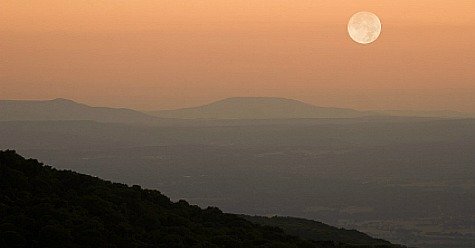 The Ozark Mountains are Arkansas' outdoor playground full of wildlife, sparkling clear rivers and lakes, interesting villages & resorts, and romantic sunsets followed by brilliant night skies. 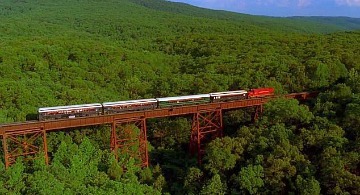 Ozarks & Eureka Springs Cheap Getaways - romantic Lodging, Lakefront Cabins, B&B's & vacation package deals for Northwest Arkansas. Eureka Springs - Tucked away in the mountains of Northwest Arkansas, historic Eureka Springs has some attractions for romantics, including horse-drawn carriage rides, country music dinner shows, and a charming downtown of candy shops, art galleries and cafes. 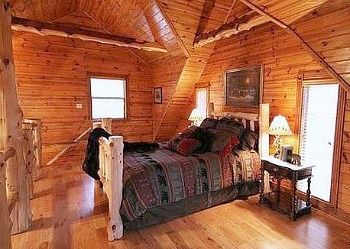 Cinnamon Valley Hideaway Romantic Cottage - this secluded Ozark Mountains cottage is the prefect romantic retreat for couples in Eureka Springs, with loft bedroom, private deck & barbecue and jetted spa tub. Arkansas Highway 7 Scenic Byway through the Boston Mountains from Buffalo, AR to Russellville, AR. Highway 14 through the Ozark National Forest between Mountainview, AR and Yellville, AR. Hardy - small but extremely attractive Ozarks community with historic buildings and downtown, a vintage car museum, numerous places for hiking and kayaking, and some good eateries. Van Buren - check out their gorgeous and historic main street, or wander around the Farmer's Market (Every Wednesday and Saturday from April to December) for a taste of area produce, baked goods and local arts. Mountain View - surrounded by rivers and lakes, and home to some excellent folk music, as the town is a hot bed of artists and performances during their Folk Festival (held annually in April) and throughout the year. Altus - there's tasting at any of the 4 wineries here in the "Wine Capital of Arkansas". Old Mill Park - One of the most romantic spots in Little Rock has to be Old Mill Park. Made famous in the movie Gone With the Wind, the quiet and picture perfect garden and setting is a great spot for a romantic picnic. River Market – lots of activity in this fun indoor market in Little Rock. A great place to shop for crafts and collectables, and try different foods and ethnic dishes too. Try Camp David (600 Interstate 30, Little Rock, AR 501-975-2267) for their attractive atmosphere and custom sauces made table side. Or enjoy romantic dining and one of the best river views in Little Rock at the Brave New Restaurant (2300 Cottondale Lane, Suite 105 501-663-2677) with their fine wine list and chocolate crème brulee. 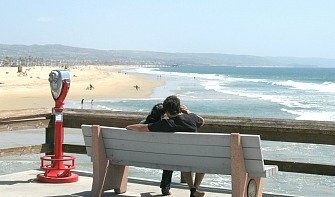 Lookout Point Romance Packages - featured above, they have a very nice 3-night package which would suit any romantic weekend, anniversary or honeymoon escape. 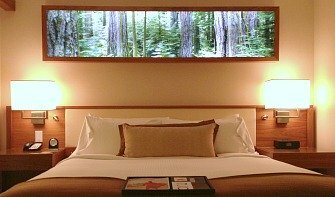 Included is whirlpool suite accommodation, wine chocolates & appetizers, a couples massage, admission for 2 to Garvan Woodland Gardens in Hot Springs National Park and a $50 romantic dining credit. 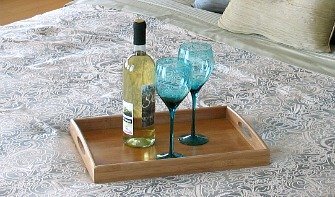 Oak Crest Cottages Eureka Springs, AR Anniversary Packages - wow, you can celebrate your anniversary in a romantic tree house! 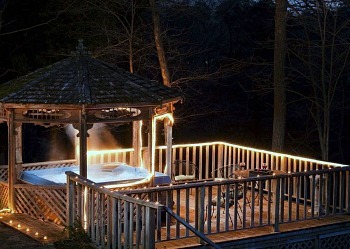 Includes cake & champagne, spa basket and 2 wonderful nights in a suite with in-room hot tub. Need a getaway from Arkansas? Straight north, Missouri offers wine country touring and some great fine accommodation options, and heading southwest gets you to fun getaways in Texas. 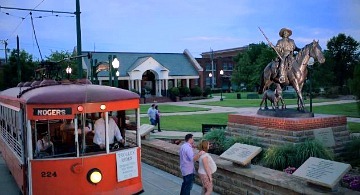 Or, travel straight west and discover the mix of outdoors and history that is unique to Oklahoma getaways.